This weekend, NPR’s Guy Raz interviewed Mark Stout, the official historian at the International Spy Museum. Their topic? Numbers stations. Click hear to go to NPR’s webpage, listen and/or read the full transcript. You can also download an MP3 audio file of the report by clicking here. For even more numbers station audio, check out the piece that shortwave enthusiast, David Goren, produced by clicking here. Also, read all of our various articles that mention numbers stations. This entry was posted in News, Numbers Stations and tagged National Public Radio, NPR, Numbers Stations, Shortwave Number Stations, Shortwave Radio on July 18, 2010 by Thomas. Would you like to buy a shortwave radio as a gift for someone, but you don’t know a thing about radios? Or, are you thinking about buying a radio for yourself (cashing in a gift card, for example) but aren’t sure how much you need to spend to be satisfied with function and performance? Want a little help leaving a hint for Santa or Ms. Santa? If so, no worries: you’ve found the right place in this vast world wide web to answer your questions, or help you with that hint–just leave a link to this article somewhere that Santa can find it! Following you’ll find a few select radios I recommend based on best performance, lowest price, and ease of use. I’ve also included current pricing and made suggestions where these radios may best be purchased. Of course, radios are available at large internet retailers–occasionally for better prices–but I highly recommend you purchase from the manufacturer and/or authorized retailer. Most radio retailers offer much better customer support in case you have a problem or question, or just need a little help getting started. This quick guide is basic, non-technical, and to the point. For more comprehensive reviews, please consult SWLing.com’s Radio Reviews page. Also, take a look at our new Radio Marketplace page where we have pre-filtered shortwave radio eBay search results. I start with this category because I believe that if you’re going to the trouble of finding the right radio as a gift, you at least want one that will perform and give years of listening pleasure. All of the following radios are sure to please those who are new to shortwave radio, and seasoned radio listeners as well. Most of these radios fall between the $100-150 price range. The G4000A is a great portable radio and I include it here first because it is a part of a special promotion continuing through the end of March 2010. The receiver performance is very good, and it has all of the major features one might expect in a radio in its price class. I owned a version of this portable for over ten years and traveled with it extensively–it’s the perfect little travel companion, and it even has an alarm clock. But what’s really amazing about the G4000A is that it’s currently part of an exceptional package promotion by Universal Radio. If you buy the G4000A for $99.99, you also receive a free Grundig FR350 self-powered (emergency) shortwave radio, and a Grundig AN200 indoor antenna. I wrote about this special in a previous post if you want more info. Suffice to say, this is the best advertised deal for a portable shortwave radio I’ve ever encountered. You could, of course, buy the G4000A for someone and give the two extras as gifts to others on your holiday shopping list–or, better yet, keep one for yourself! To my knowledge, this special is only available through Universal Radio. This Sony shortwave radio is a classic, with solid, time-tested performance, and features to please both the beginner and the seasoned radio enthusiast. The instruction manual is comprehensive and easy to read. Read the full review here. The Grundig G3 was introduced in August 2009. It’s the latest portable receiver from Grundig and is an upgrade of the popular Grundig G5. I reviewed this radio right after it hit the market and found it to be excellent, save that its sync detection (a new feature for this model) did not perform up to spec, so I simply never use it–but this is no problem, as the receiver has many other outstanding features. The latest models of the Grundig G3 all have good sync detection. Overall, the G3’s performance is on par with–or in some respects, better than–the Sony (above). Read full review here. Seach eBay for a Grundig G3. This large portable would be my first pick for someone who wants excellent radio performance, but also wants a radio that is very simple to use (i.e., grandparents, children, your uncle who gets muddled by the TV’s remote control). It comes with an owner’s manual, but you most likely will not need it. The CCRadio-SW has robust, room-filling sound, and is a joy to operate. Ergonomics are excellent, and it sports a large tuning knob. Performance is top-notch on all shortwave bands and it’s top of it’s class on Medium Wave (or the AM broadcast band). It’s a little bigger than the previous radios (not really for flight bags), but still fine for car, camper, and fishing trips. The CCRadio-SW will please both the beginner and seasoned radio listener; speaking for myself, I find I use mine all the time. Read the review here. Purchase directly from C. Crane, Universal Radio or The NPR Shop. This radio is more expensive than the others listed here, and is not a portable, however, I couldn’t help but include it because I recently reviewed this radio and found that it offers high-end performance for a fraction of the cost of a tabletop receiver. The little RX-320 is PC-controlled, meaning, you need to hook it up to a computer to bring it to life. It’s the perfect gift for your favorite ham radio operator or a computer enthusiast who also likes radio. Read the full review here —or, if you prefer, a short review here. Let’s face it, these are tough economic times, and it may very well affect your gift budget this year. Below, I’ve put together a small list of radios for $100 or less that would make excellent gifts for a radio enthusiast or for someone who has never used a shortwave radio. Keep in mind, of course, that you pay for what you get; thus these radios do not perform quite as well as the portables above. The G6 has many of the features of the portables above and comes at a much better price and in a smaller package. This radio could easily fit in a glove compartment or coat pocket. Its shortwave radio reception is very respectable for such a small radio. Read the full review here. Purchase the G6 from Universal Radio or Grove Enterprises. Search ebay for a Grundig G6. The Kaito KA1103 (a.k.a. Degen DE1003) offers the best performance I’ve tested under $100. But keep in mind, the ergonomics of this radio (pretty much any Kaito/Degen radio) leave something to be desired: for example, to turn up the volume, you have to press the volume button and use the tuning knob to adjust. Still, it’s fairly easy to operate, and comes with a one-of-a-kind digital display that imitates an older analog style dial. Another Kaito/Degen Product to consider is the KA1102/DE1102–read a review of this $60 portable here. In general, I’ve found that Kaito offers great performance for price, but their quality control is sometimes sub-par. I have had to return two of their products in the past, and each time was relieved I had purchased from an authorized dealer (see below). Read the KA1103 full review here. Purchase the Kaito KA1103 from Grove Enterprises, Universal Radio or Kaito Electronics (a bit pricier). Search ebay for a Kaito KA1103 or Degen DE1103. The CCRadio-SWP has a great receiver, especially in such a tiny package. C.Crane ergonomics are always very good, and you’ll probably never read the manual, it’s so simple to operate. I keep one of these in my car to listen to shortwave radio when I have few minutes to spare. A few “AA” batteries will run this little radio for 70 hours! Now, the CCRadio-SWP has some limitations, as does any little radio in this price bracket, so read the full review here before purchasing. But this cute radio can make a great stocking stuffer–and will fit in that stocking’s toe just fine! Purchase the CCRadio-SWP directly from C.Crane or from Universal Radio. The Grundig G8 is a nice pocket radio and the perfect traveling companion. I’m quite impressed with this radio. Shortwave reception is good and FM reception exceptional. The AM broadcast band does suffer from some images, though still quite respectable. The G8’s audio is a little tinny, though quite good for a radio this compact. The customary price for the G8 is $49.95, but occasionally retailers place them on sale for nearly half this price. It’s a grab at $50, it’s a steal at $25! Purchase the Grundig G8 from National Geographic (only $24.95 at time of this posting). 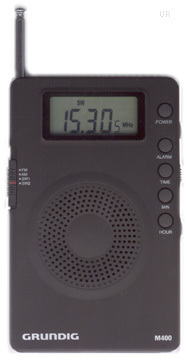 The M400 is a fun, ultra-portable, ultra-thin shortwave radio. Though its performance isn’t as good as other portables on this page, it is a super simple radio and is quite capable of picking up strong SW broadcasters–at $30, it’s also super affordable. 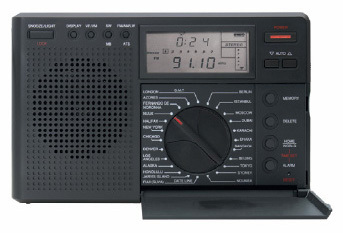 I wouldn’t purchase this radio for someone who is just discovering shortwave radio since they will want a better performer with more features (like the portables at the top of this page). I do think the M400 makes for a nice stocking-stuffer or small gift for the radio enthusiast in your life. I take mine with me on morning walks and overnight travels. Purchase the Grundig M400 from Universal Radio. This entry was posted in Radio Gift Guide, Radios, Reviews and tagged C. Crane, CCRadio-SW, CCRadio-SWP, Degen DE1103, Grundig AN200, Grundig FR350, Grundig G3, Grundig G4000A, Grundig G6, Grundig G8, Grundig M400, Kaito KA1103, M400, RX-320D, Shortwave Radio Gift Guide, Shortwave Radio Reviews, Shortwave Radios, Sony ICF-SW7600GR, Ten-Tec on July 17, 2010 by Thomas. Check out the Palstar R30A in its new wood cabinet! The R30A is an excellent receiver and Palstar has a reputation for excellent customer service and product quality. Per Palstar, pricing is $175 for the wooden cabinet. Thanks to Mike Hansgen for the tip! This entry was posted in Radios and tagged Palstar, Palstar R30A, Shortwave Radios on July 11, 2010 by Thomas. The Netherlands will face Spain in Johannesburg on Sunday 11 July at 1830 UTC in the final of the FIFA World Cup 2010. Radio Netherlands Worldwide has posted the broadcast frequencies for this event and we have them listed below. Thanks to RNW Media Networks for this info. UPDATE: Did you record the FIFA World Cup on shortwave? If so, please send me your audio, I would be happy to post it on SWLing.com. This entry was posted in News and tagged FIFA World Cup 2010, Radio Netherlands, RNW, World Cup on Shortwave Radio, World Cup Shortwave on July 9, 2010 by Thomas.